The Priory Church, now an Grade A listed building, was once part of a medieval Carmelite Friary at the hub of life in the royal burgh of Queensferry. The town of Queensferry grew up around a ferry passage which was established by Queen Margaret of Scotland in the 11th century, to transport pilgrims across the Forth to holy shrines in Dunfermline and elsewhere. The ferry port on the South bank is believed to have been located at the Binks, the site of the present day car park. One of the early families to settle in the area was that of the Dundases whose ancestry, linked to Dundas Castle (1 mile south of the town), can be traced to the early 12th century. It was George Dundas of Dundas who first invited the religious order of the Carmelites to the Queen's Ferry about 1330 where, beginning with temporary buildings, they would have established a pattern of life revolving around daily worship, farming, teaching and hospitality. In 1440, James Dundas confirmed to the Carmelite brothers a piece of land for the construction of a monastery. The current Priory church building dates from that time. The religious changes brought about by the Reformation led to a decline in the influence of the friars and, in 1560 the last Prior, Father Thomas Young, returned the land and buildings of the Priory to the Dundas family in a charter confirmed by Mary Queen of Scots. In subsequent years, the buildings were put to a variety of uses by the townspeople: as a school, a parish church, for the drying of fishing nets, storing potatoes and coal, selling groceries and stabling horses. 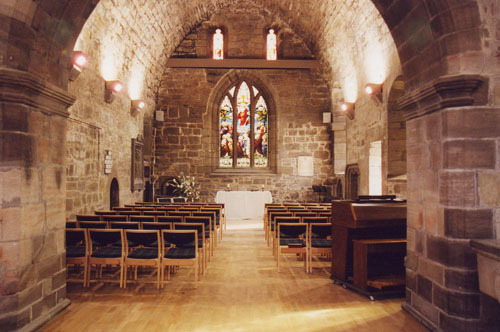 The choir area was used as a burial place and memorial chapel for the Dundas family. During this time, the cloisters and domestic buildings to the north of the church fell into decay and by the late 19th century these, along with the nave of the church had been demolished. The Priory has undergone 2 major restorations in its time. In 1890, the remaining buildings comprising the choir, the tower and the south transept, were restored for use by the Scottish Episcopal Church under Bishop Dowden of Edinburgh and the architect, John Kinross. Thus for the past 100 years, the Priory has once again been a place of regular worship. The second major work of restoration took place in 1999 / 2000 which should ensure that this building remains in use for many years to come. Much of the work done was to protect the building from damage caused by water corroding the stonework. For a more welcome feel to 21st century users, a wooden floor with underfloor heating has replaced the concrete one and new lighting highlights the simple beauty of the building.